Reiki Practitioners of all levels, styles, and lineages are welcome to join us. We will start our circle with a guided meditation to create sacred healing space, activate Reiki and unite the group's energies. We will then practice doing reiki on one another and share the blessings of this beautiful energy, as we enjoy each other's company. We will leave feeling rejuvenated, uplifted, and possibly more enlightened! Reiki shares are known to increase the love in our heart, so don't be surprised if you want to hug your loved ones when you get home or find yourself hugging a tree! 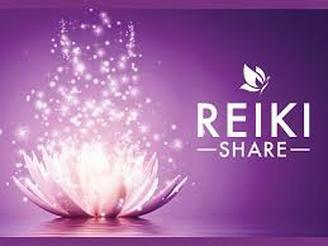 Sharing Reiki is a great way to develop and expand your skills as a healing practitioner. There is always more to give, and more to receive! Wednesday, April 17, 2019, 7:30-9:30pm.